It was 30-years-ago this weekend that we were introduced to Ray, Egon, Peter and Winston. 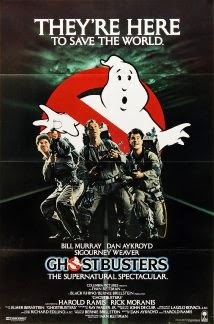 Yep, "Ghostbusters" is marking its 30th anniversary and the news just broke that to commemorate this occasion, a restored and remastered version of the spooky hit with materialize in more than 700 theaters on August 29. Entertainment Weekly just reported the news, "The theatrical re-release is the centerpiece of a Ghostbusters’ anniversary celebration that will also include special events, collectible merchandise, and a new home-entertainment release. The Ghostbusters 30th Anniversary Edition Blu-ray, as well as the Ghostbusters II 25th Anniversary Edition Blu-ray will be available on Sept. 16. It’s the first time the 1989 sequel has been released on blu-ray, and the editions’ special features include new conversations with director Ivan Reitman and Aykroyd, as well as deleted scenes from the sequel." The official site is pretty fun so head on over there for more details and cool visuals. Here's Ray Parker, Jr.'s video to put you in that 80s mood. You're welcome.